It's easy to understand why the Back Bay is one of America's most desirable neighborhoods. 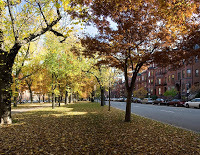 Newbury Street, Boylston Street and Commonwealth Avenue are lined with unique shops, trendy restaurants and vintage homes, making the Back Bay an extremely fashionable destination for Boston residents and visitors. In fact, it's not uncommon to spot celebrities strolling up and down these picturesque streets. Last updated April 24 at 10:19 pm.